to our templating language to make it easier for you to customize your blog’s look and feel. These new expressions proved popular with those of you who enjoy advanced blogging tools, so we wanted to offer you even more flexibility. Starting today, we’re introducing a new set of operators, which we’re calling lambda expressions, that allow you to apply rules to whole sets of data (think posts, comments, or labels), rather than just individual instances. Let’s say you wanted to add a flower image to all posts with the label “Flower,” for example. With lambda expressions, simply define a variable name that each item in the set will take, and then refer to the variable name as though it were each item. There’s lots more that you can do using lambda expressions, like only showing posts in your feed with a given label or quickly calculating how many posts you have with a given number of comments. For a full list of the new lambda expressions available, check out the help forum. Last May, we added some expressions to our templating language to make it easier for you to customize your blog’s look and feel. These new expressions proved popular with those of you who enjoy advanced blogging tools, so we wanted to offer you even more flexibility. 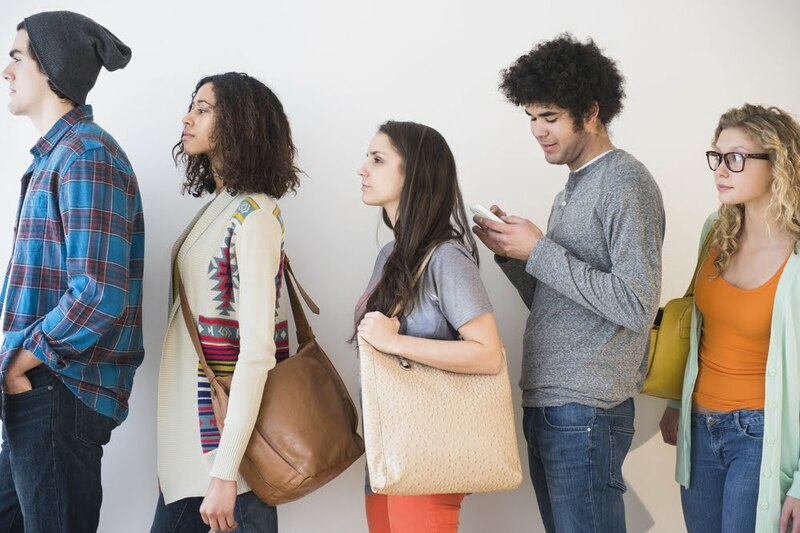 AdSense Guide to Audience Engagement. Research shows that 29% of smartphone users will immediately switch to another site or app if it doesn’t satisfy their needs. To help keep your audience engaged, get your free copy of the AdSense Guide to Audience Engagement. If you’re interested in more updates from the Google AdSense team, follow us on Google+ and Twitter. We’d love to hear what you think. Posted by Jay Castro, the AdSense Team. Today, information is at our fingertips and we can access it from anywhere on any device. Just a few taps pull up millions of websites all competing for our attention. For bloggers, engaging with your audience has never been more important or more challenging. To help lay the foundation to a winning engagement strategy, the AdSense team created the AdSense Guide to Audience Engagement. HTTPS is fundamental to internet security; it protects the integrity and confidentiality of data sent between websites and visitors' browsers. Last September, we began rolling out HTTPS support for blogspot domain blogs so you could try it out. Today, we’re launching another milestone: an HTTPS version for every blogspot domain blog. With this change, visitors can access any blogspot domain blog over an encrypted channel. As part of this launch, we're removing the HTTPS Availability setting. 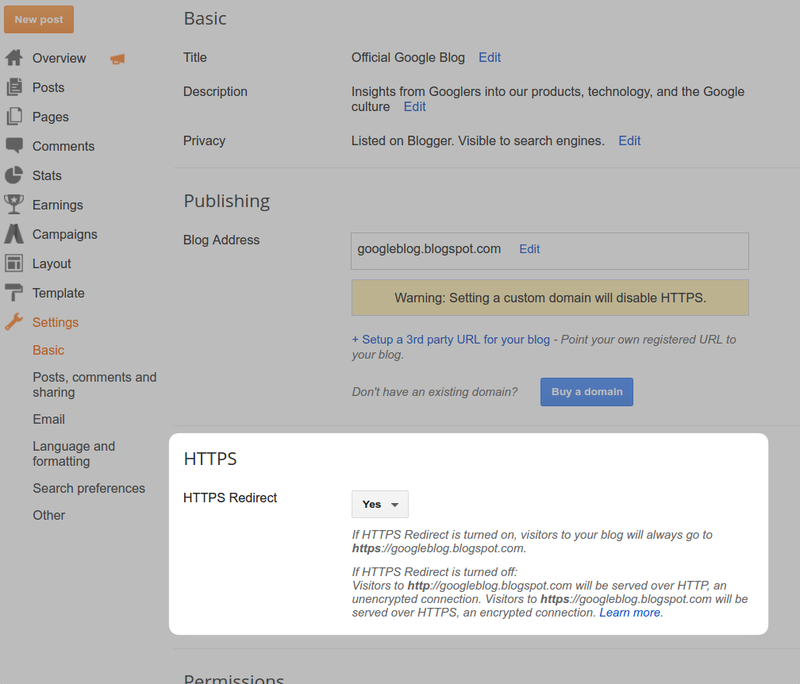 Even if you did not previously turn on this setting, your blogs will have an HTTPS version enabled. We’re also adding a new setting called HTTPS Redirect that allows you to opt-in to redirect HTTP requests to HTTPS. While all blogspot blogs will have an HTTPS version enabled, if you turn on this new setting, all visitors will be redirected to the HTTPS version of your blog at https://<your-blog>.blogspot.com even if they go to http://<your-blog>.blogspot.com. If you choose to turn off this setting, visitors will have two options for viewing your blog: the unencrypted version at http://<your-blog>.blogspot.com or the encrypted version at https://<your-blog>.blogspot.com. Please be aware that mixed content may cause some of your blog's functionality not to work in the HTTPS version. Mixed content is often caused by incompatible templates, gadgets, or post content. While we're proactively fixing most of these errors, some of them can only be fixed by you, the blog authors. To help spot and fix these errors, we recently released a mixed content warning tool that alerts you to possible mixed content issues in your posts, and gives you the option to fix them automatically before saving. Existing links and bookmarks to your blogs are not affected by this launch, and will continue to work. Please note that blogs on custom domains will not yet have HTTPS support. This update expands Google's HTTPS Everywhere mission to all blogspot domain blogs. We appreciate your feedback and will use it to make future improvements.